Endocrine surgery – the subspecialty of general surgery involving diseases of the thyroid, parathyroid, and adrenal glands as well as the endocrine pancreas – is a rapidly growing field of medicine that has a rich and fascinating history. As recently as the mid-19th Century, surgery for thyroid goiter was described as “horrid butchery” and believed by many to be too dangerous for any surgeon to attempt. 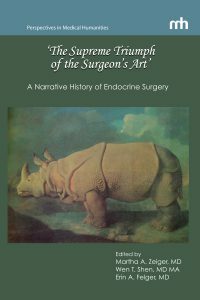 Through the ingenuity and tireless efforts of surgeons in Europe and the U.S., thyroidectomy became a safe and even elegant operation, one that renowned Johns Hopkins surgeon William Halsted would describe in 1926 as representing “the supreme triumph of the surgeon’s art.” In this unique and captivating book, these and other seminal stories from the history of endocrine surgery are vividly retold by the current leaders in the field.